It is why sport, and football in particular, creates such a compelling spectacle for television - the drama on the pitch and the reaction of the crowd spilling forth from the screen to corrupt and convert the viewer, who may well be on the other side of the planet but can no longer ignore the significance of the event. The forum which stadia provide to cheer, chastise and chant has long made football matches special; some argue such arenas are true bastions of free speech. In Franco-era Spain, Barcelona's Camp Nou home ground was one of the few places it was possible to speak Catalan without fear of punishment. Dissent towards the Mubarak regime in Egypt existed among the ultra fans of Cairo clubs Zamalek and Al-Ahly long before it spilled into Tahrir Square, and their games after the Arab Spring saw the feelings of change conveyed in song. Football chants not only provide a vehicle for identity but for the expression of wit and humor too. Playground banter is mixed with wry comment to generate entertaining, if sometimes crude, repartee which has a magic of its own. When Liverpool played Chelsea in the 1960s, Anfield was beset by a thick fog which obscured the far end of the pitch. According to legend, when Liverpool took the lead fans from the end of the ground cloaked in mist, who had been unable to see the action, chanted to the other end, "Who scored?" The reply came back in song - "Tony Hateley" - to which the fog-obscured fans retorted: "Oh, thank you very much, oh thank you very much!" But with expression comes an evaluation of what is fair to express and what is not. Some songs go beyond mere support and are there to cause offense. Such is the problem with sectarian chanting at games between Glasgow Rangers and Celtic, the Scottish government is currently considering a law that would ban the singing of offensive songs at football matches. A five-year sentence could follow for anyone found guilty. Samuel Eto'o spoke passionately about some of the racial chanting he was subject to during his time playing in both Italy and Spain, and only time will tell how he fairs now he is plying his trade in Russia. More recently the English Premier League clash between London rivals Arsenal and Tottenham Hotspur saw a minority of fans taunt Togo striker Emmanuel Adebayor about the gun attack on his national football team before the Africa Cup of Nations in Angola in 2010. Adebayor was always going to incur the ire of fans after moving from one rival to another (with brief stops at Manchester City and Real Madrid in between, admittedly), but to sing songs about an incident in which three people died was beyond the pale for the clubs. In a rare moment of unity between the two sides, a joint statement was issued which said: "[We] were extremely disappointed to hear the chants from supporters. Neither club tolerates foul language, racist chanting, homophobic chanting or any anti-social behavior from its supporters. "We shall be working closely with each other to identify the individuals involved." Spurs added they would ban fans who were involved. The fans were rightly admonished for their actions, and some would argue this is a good precedent to set for a derby game which has seen supporters from both teams - who both have a tradition of Jewish backing - subjected to notorious songs about Nazi gas chambers down the years. The difficulty with the precedent for football more widely is in the determination of what constitutes an offensive song and a passionate, if witty, chant? How many soccer fans could honestly say they have never crossed the line? It is a question that many of the Chelsea fans who traveled to support their team in a European Champions League clash against Genk on Tuesday should ask of themselves. Chelsea captain John Terry is being investigated by both the English Football Association and London police over his alleged racial abuse of Anton Ferdinand during a west London derby against Queens Park Rangers last month. Terry was seen using a racial insult in video footage of the match, but the England captain insists he was telling Ferdinand that he did not use that phrase. In response, hundreds of Chelsea fans in Belgium sang: "Anton Ferdinand, you know what you are." For so many supporters to revel in a situation so serious it is being investigated by British police, and to sing a song that would condone the worst findings of any investigation, is nothing short of appalling. It suggests there is still much work to be done to eradicate the expression of racist sympathies from the terraces. 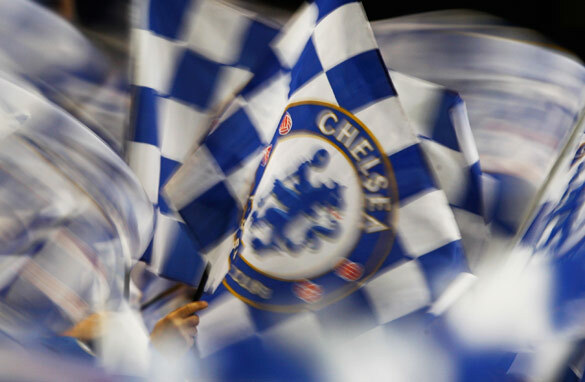 And though it is a difficult area to police, especially when the chants - as with the Chelsea example - do not actually use offensive terminology, it is surely the responsibilty of every soccer fan to stay on the right side of the lines of good taste if any progress is to be made. Let them play and let us sing! Personally, I think offensive chanting is an occasional rather than a constant problem in football. Much of what you hear from the terraces is banal and innocuous and hasn't varied much from the stuff I heard as a boy, with the same old songs and same tired insults trotted out season after season. I'm also surprised that the players can hear that much of it, except perhaps when they're taking a corner or a throw in at some of the tighter grounds. You'd have thought they'd be too focused on the game to pay attention to some missing link in row Z mouthing off, and I just don't buy Samuel Eto'o's claim that he was so sickened by the abuse during his Barca days that he considered leaving the field. Surely, as a mature adult, let alone a footballer, he'd have developed a thicker skin? That being said, racist, personally insulting, or culturally insensitive chanting, when it does happen, is anchronistic and has no place in modern life let alone modern football. The players may be the targets but it's the majority of innocent fans, some with children in tow, who have to endure this objectionable nonsense close up and they shouldn't have to. Generally speaking most fans appreciate the boundaries between passionate support and unwarranted abuse, and when the ignorant minority do overstep the mark you can often feel a genuine ripple of disgust amongst the crowd. So I applaud the efforts of the Scottish government to make it a criminal offence punishable by imprisonment and I hope other governments follow suit. Footballers aren't choirboys and football fans don't always strike the right note, but the game-day experience would be a lot better for all without its uncouth soundtrack, occasional or otherwise. "Scottish government is currently considering a law that would ban the singing of offensive songs at football matches. A five-year sentence could follow for anyone found guilty." Really????? Unbelievable!– Political correctness run amok. Freedom of speech should ALWAYS be protected! Offensive language, while unpleasant to some, should be protected. It reflects poorly on the people using the offensive speech as it well should. There is absolutely NO need for the government to start deciding which speech is acceptable and which is not. As a fellow West African and a follower of the EPL, I have lost all respect for Arsenal as a club. Ade before the game had made efforts to bridge the divide in admitting his error in celebrating in such a manner when he was in City's shirt. To be subjected to such unsavoury chanting was beyond belief! At present Arsenal's position and form vindicates any player that left the club. I hope the finish mid-table as that is what they deserve both on form and class! The article title is about football....so why is the article about soccer??? Maybe because in 95% of the world, footballl IS soccer? Nick, I think you'll find it's the other way round. 1: The Scottish Football Association is implementig new laws to try and stop hatred and violence at football matches including before and after the games. The legislation seeks to create two new offences relating to offensive behaviour that can "incite religious, racial or other forms of hatred, in and around football grounds and on the internet". This is mailnly aimed at Rangers & Celtic, the two largest clubs in Scotland. They have a long history of violence and a rivalry that runs much deeper than just a sporting rivalry. The vast majority of Celtic fans are Catholic and regularly clash with the mainly Protestant fans of Rangers whenever they meet which is usually at least 4 times per season. With very good reason the governing body of their league is trying to put an end to the sectarian related violence and chanting at all games. 2: I certainly do not condone the chants made by Arsenal fans but would say this is a very rare occurance, especially for Arsenal fans who are building a reputation of being very quiet at games. This reputation is mainly due to the price structure for tickets at their home ground, The Emirates, meaning it is filled with tourists and businessmen rather than "true" football fans. 3: The chants at football matches can be fantastic and I love joining in while watching my local team, Leeds United. Often the chants will poke fun at the opposing team or a rival team but are usually no more than a bit of fun. Occasionally you do hears chants that are crossing the line and do not have to join in if you don't want to. This is quite rare but does happen. rob from leeds, dont ye mean the vast majority of celtic fans are republicans and rangers fans unionist/loyalist. Football matches are life's opportunities to celebrate the gift of life and to render thanks to the giver of life. Singing, music, dancing and chanting are all fine as long as they add joy and beauty to the Beautiful Game. Playing football is a great talent and art. We need to count ourselves lucky to be living at a time when great and talented players are gracing the footballing horizon on our tiny Planet. Let us wish ourselves happy times as we make our presence felt on the football fields. chealsea is my club,i cant let it go because of its offense, all im saying is john terry repent. The word "soccer" comes from the original name of the game "Association Football" or more precisely from its abbreviation Assoc. Assoc. was a slang term used in UK universities from about 1889. It later became socca, socker (1891) and finally evolved into soccer (1895). The Football Association was founded in London in October 1863 by eleven clubs/schools. The Association agreed upon a standard set of rules prohibiting use of the hands or carrying the ball. The clubs which opposed this rule eventually broke away conceiving their own version of the game – rugby. Being a die hard Ajax Amsterdam fan, we use the star of david in our banners and because the city was considered jewish we make references to jews. Our arch enemy Feijenoord Rotterdam chants songs "Hamas, Hamas, give the jews gas" and we sing song about world war 2 "bommen op Rotterdam" in reference to when the city was flattened. These are traditions that will not go away anytime soon, they are embedded in the culture and are here to stay, like or not...it is what it is. Stop calling it Soccer CNN. Gawd! @John Foster – clearly the notion of freedom of speech is being abused in these countries. Do you really think that these 'offenders' would feel remorse for their actions? doesn't such inaction encourage and even nurture more people to follow similar actions? Your point is valid for mature and responsible people. Which is something these offenders clearly lack. If any team gets punishe bc of fan behaviour then only let the women and children watch at a low cost or for free. It worked with Fenerbahçe S.K.! First and foremost chanting and taunting have been part of sports since the Roman empire had evented the use of gladiators for sport,amusement,and the setling of scores.The Roman family that can boast of the best and the powerful gladiators are reverred.To the issue of racial chamting & taunting,it's borne out jealousy and envy when you can't beat or punish the person involved you resort to personal issues related taunting. I don't think black players should just "develop a thicker skin, " as you suggest. These players represent all of us and if they, as superstars, can be subjected to such demeaning acts, then these idiots will only feel emboldended to do worse to others who do not have the international spotlight on them. What you are saying is completely irresponsible and insensitive. That's like telling our daughters to "shake it off" if someone is sexually suggestive or aggressive, the idiot might feel like he can just have his way with any woman he wants in the future. Do you not see that? These racist animals are like children who need a firm hand and your responsibility is to be a good parent. God help us if you are ever in a position of power. I am doing a paper on the football subculture and was wondering if anyone could tell me how/ why violence is incorporated in the sport and what the purpose to the fighting is /means? any comments would be appreciated.